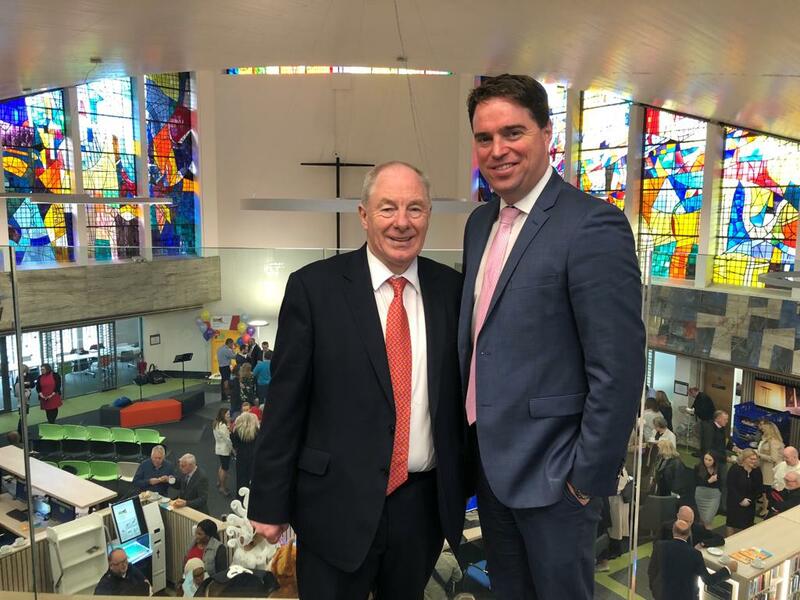 Athy’s fantastic new Community library is an example of the ongoing Government Investment in Athy, according to Fine Gael TD Martin Heydon. Set in the unique surroundings of the former Dominican church, the new library was officially opened by Minister for Rural and Community Development Michael Ring today. “This €3.75m project jointly funded by Government and Kildare County Council is a fitting transformation of the former Dominican Church into a modern inviting and inspiring community space. It has been designed to meet the growing needs of the citizens of Athy and its surrounding areas and will act as a hub for education cultural and civic activities in the town. “The library is one of many ongoing state investments in Athy at present with site clearing work about to commence on the Southern Distributor Route, planning to be lodged for the new Primary Care Centre and a 600 pupil extension sanctioned for Athy Community College. Add to this the feasibility study for the expanded heritage centre museum, planning permission for the Barrow Blueway and the plans for the rest of the Dominican site and the potential for Athy is obvious. “This was a dark week for jobs in Athy and our thoughts are with the workers of Coca Cola and their families as they deal with the shocking news of this week. “Minister Ring and I met with the Senior Officials from Kildare County Council, Co. Kildare Chamber, the Local Enterprise Office and Athy Area Cllrs to discuss the Coca Cola announcement and the next steps needed for staff and the town alike following the official opening today. “Working together we want to ensure that every option for job development and training in Athy is explored and pursued in a speedy manner. Minister Ring gave is his full support and we discussed different funding opportunities that will arise for the town from his department. “Minister for Business Enterprise and Innovation Heather Humphries has also accepted my invitation to visit Athy at the next available opportunity with representatives from IDA and Enterprise Ireland to ensure a coordinated response from all state agencies. “It was a dark day for Athy when the Dominicans announced their plans to depart in 2015 but today’s official opening shows that positives can come from such events. Athy has great potential and I will continue to work with my local colleagues to ensure that it is fully realised.